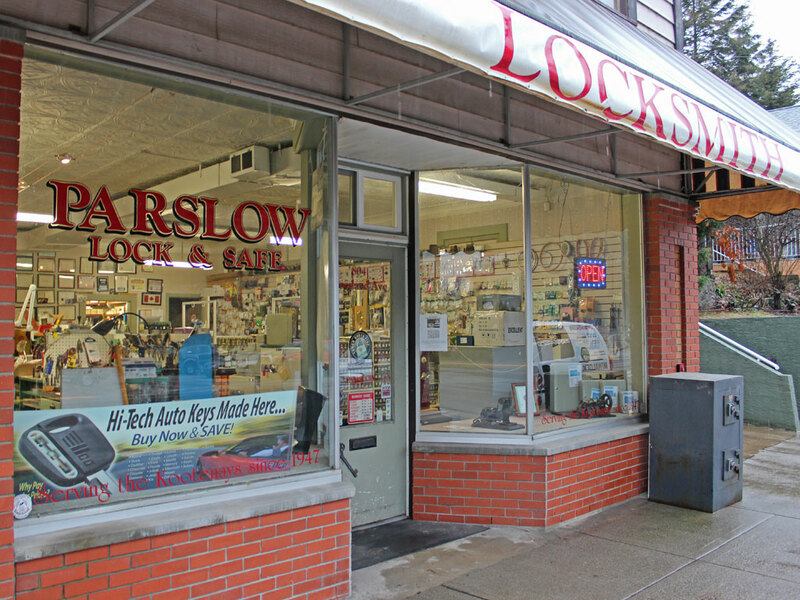 About | Parslow Lock And Safe Ltd.
Alf Parslow was in the armed forces stationed in England during World War II. During the latter part of the war, Alf spent some of his time learning how to open locks and machine replacement keys. This hobby later turned into a full-time business. Alf returned to Canada after the war and started a job at Cominco. In addition to his job at Cominco, Alf operated this business on a full-time basis. Later, the shop moved to East Trail, and in 1975, Alf hired his nephew Vern Blair to assist with his growing business. By 1982, Vern had become a partner, and he eventually bought out Alf in 1989. Vern’s son-in-law, Randy Smith, started an apprenticeship in 1997 and has served continuously since then. On June 1, 2011, Vern sold Parslow Lock & Safe to Randy and Sherri Smith, who continue to operate in the same location on Rossland Ave across from the Fire Hall. Vern continues to work on a part-time basis. Come on in and let Randy, Vern, Chris or Steve help you. We will provide you with friendly, knowledgeable, service and advice for all your lock, safe or key needs. Parslow Lock & Safe Ltd is a member of the British Columbia Association of Security Professional (BCASP), The Professional Locksmith Association of Alberta (PLAA) and the Trail District Chamber of Commerce.